There are so many sauce companies out there and it is time for me to introduce you to one local company that will blow your taste buds away! La Dee Da Gourmet Sauces is based out of Hamilton, Ontario and run by three amazing and busy savvy women, Marlow, Mary, and Jo Anne! (Can we say #girlboss?) All their products are all natural, plant based, vegan, gluten and dairy free, have no added sugar, are low in sodium and have no artificial colours or flavours. And you can definitely taste the difference. It is nothing like the regular canned or jar stuff you are used to! Jo Anne and Mary started La Dee Da three years ago! A year into business, Mary’s long time friend Marlow reached out to congratulate Mary on her new company. Sadly, Marlow lost her beloved husband Frank around this time and felt she needed something in her life and she wanted to share her infectious energy. Marlow has the same values and passion for healthy eating as Jo Anne and Mary and they knew they had to add Marlow to the La Dee Da team! After months of market research, the La Dee Da team focused on creating four amazing products that are versatile, on trend and to top it all off, healthy and tasty! The four sauces they currently have now are the Savory Basil Mushroom Sauce, the 12 Veggie Tomato Sauce, the Spicy Sweet Wine Relish, and the Butternut Squash Beet Sauce. 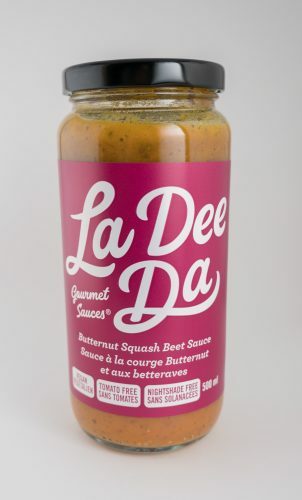 I love how La Dee Da chose to focus on a few sauces to begin with so they can perfect and get everything right with the line of products they currently have! This is a very versatile and tasty sauce. It works great on pasta, veggies, rice, or any types of meats! I actually used a little of this sauce in my basil fried rice dish to amp up the basil flavour and loved it! 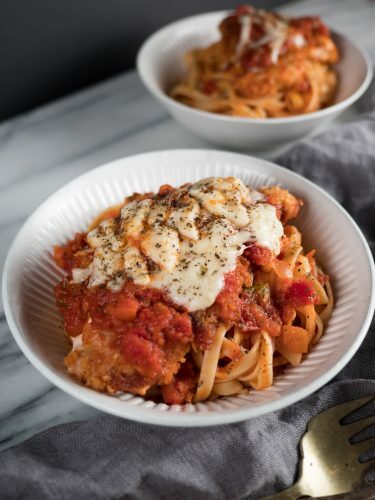 This sauce is also gluten and dairy free! And if you are curious about the ingredients: Cremini, Shitake and Oyster mushrooms, water, shallots, extra virgin olive oil, garbonzo flour, green onions, fresh basil, fresh garlic, himalayan pink salt, black pepper, chili peppers, dried basil. 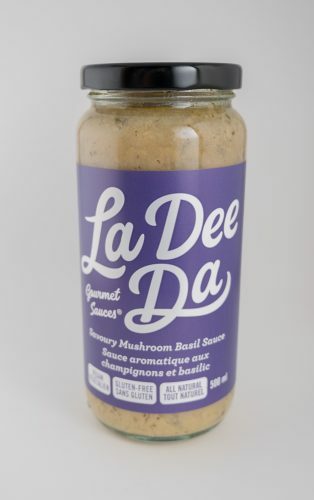 This is Marlow’s favourite sauce and it is her go to ‘open and pour sauce’ that is perfect for an easy risotto meal! Yum! You really cannot go wrong with this one! It is perfect for pasta, pizza, you can also add a little Alfredo to make it a rose sauce too! This sauce is one of the only sauces on the market that you can eat both hot or cold! It is so versatile it can be used as a salsa, bruschetta topping, soup base, chili base and pairs well with any meat or fish. In this sauce you will find no acidity as it is produced with water versus sugar that is used in most sauces. The ingredients are awesome and super healthy (If you are curious: Water, tomatoes, sweet onions, carrots, celery, zucchini, shallots, extra virgin olive oil, parsnips, sweet potatoes, turnip, fresh parsley, fresh garlic, fresh basil, Himalayan pink salt, black pepper, dried basil!) 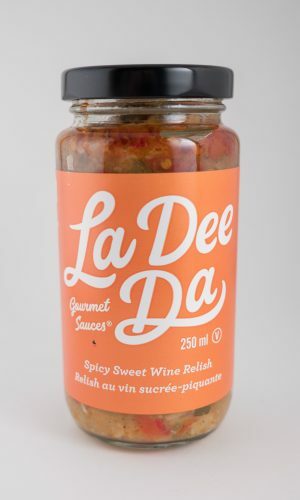 This is Jo Anne’s favourite sauce and she uses it as her ‘go to’ healthy Salsa on Friday nacho nights (she also adds the Spicy Sweet Wine Relish to kick it up a notch)! Sounds like a winning recipe to me! Where sweet meets heat!! This gourmet relish is layered with flavours that pairs well with any cheese and charcuterie platters. It is a perfection addition to your burgers or hot dogs during those summer BBQs! If you want a little kick to your 12 Veggie Tomato Sauce, you can add a touch of the spicy sweet wine relish to kick it up a notch! The ingredients are clean and delicious like all their other sauces. (Peppers (red, yellow, orange), zucchini, apple cider vinegar, pure apple cider, extra virgin olive oil, sweet onions, fresh garlic, Ice Wine, Jamaican hot peppers, jalapeño peppers, yellow hot peppers, green onions, black pepper, chili peppers.) 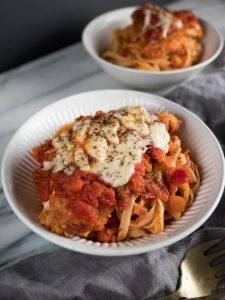 This is Mary’s favourite sauce and she uses it over a brie Cheese and adds some roasted nuts and sun-dried tomatoes and bakes it to make a great appetizer and crowd pleaser! You will continue to see big growths for La Dee Da, they have teamed up with Arlene Dickinson (yes, the amazing Arlene from Dragon’s Den) and District and Venture Communications to continue to grow their brand in 2019! They are planning new product launches for 2019 as well so stay tuned! Currently, you can find La Dee Da amazing line of sauces at select Metro, Sobey’s, Denninger’s, Wholefoods and Pusateri’s. Keep your eyes open for their launch at all 23 Fortino’s locations coming this February 2019!! They have also acquired National Distribution and you will start seeing their products across Canada! If you are looking for their sauce and cannot find it in your favourite stores, let them know and they will get their sales team working on it! 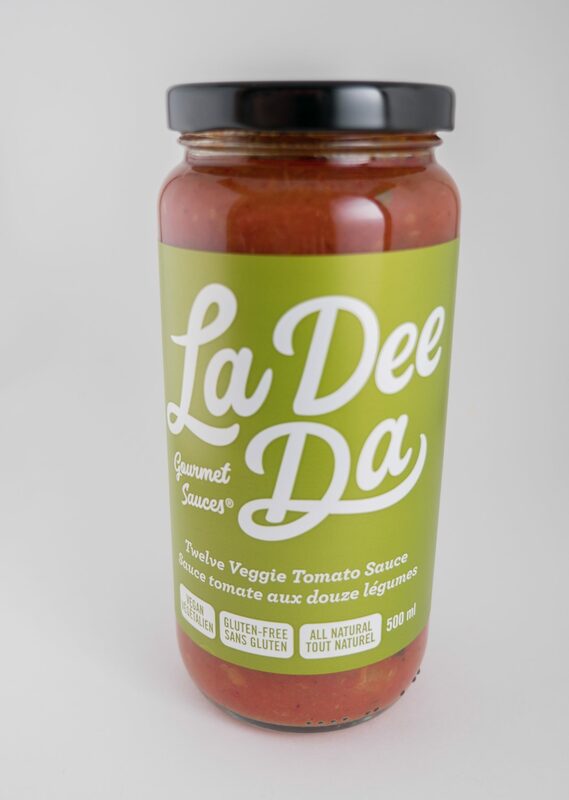 They also have a fun promo going on through their social media channel where you can win a prize package worth over $100 by using #createwithladeeda and sharing a picture of your favourite meal made with La Dee Da sauces! Check out all the details here on their Instagram page.